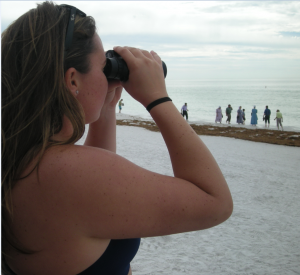 This Siesta Beach lifeguard truly sees the world through multiple lenses. The twin lenses of binoculars, the lenses God gave her, and the telephoto lenses of her digital SLR camera. We can thank Ringling College recruiters and her love of the water for bringing this outgoing and accomplished swimmer and lifeguard to our shores. Stephanie Ganey (27) has been guarding beach-goers on the magnificent coastline of Siesta Key for more than 2 years. She started as a summer, seasonal lifeguard while attending Ringling College of Art & Design and was eventually hired on as a full-timer by Sarasota County. She currently holds the distinction of being the only female lifeguard on Siesta Key. This multi-faceted young woman grew up north of Dallas, in Plano, Texas. A graduate of Plano West High School, she not only swam for her high school, but managed to qualify for a position on the Metroplex Aquatics, USA swim team. As a short course free-styler, Stephanie became the fifth fastest swimmer in the Dallas region for the 50 and 100 meter. Her twelve years of competitive swimming also found her competing as far away as North Carolina and Maui, Hawaii. She has a real talent of cutting through the water at near record times. Before her senior year of high school, Stephanie attended pre-college classes at Ringling College. Stephanie quipped, “that sealed the deal.” She knew she wanted to go to art school and being close to the beach and around this atmosphere was a perfect fit for her. As a result, she moved to Sarasota immediately after high school in 2004. She moved here alone to study photography at the Ringling College of Art & Design and now has a BA degree in Fine Arts with a focus (pun intended) in photography. Siesta Beach lifeguards are among the most trained and qualified in the country. Stephanie is CPR and defibrillator (AED) certified as well as oxygen use qualified. She related some of the equipment differences among the four lifeguard towers on Siesta Key. The north and south towers are equipped with full stat packs, an AED, and a vehicle. The center two towers are equipped with stat packs that carry oxygen and regular medical supplies. This allows our lifeguards to handle just about every emergency imaginable. As you would expect, lifeguards also must be fit. As a first step, every seasonal and full-time lifeguard is required to do a half mile run in under four minutes, a 500 meter swim in under ten minutes as well as two beach rescues. Success in these areas might get you an interview. Not long ago she and lifeguard Martini gave medical assistance to a woman having cardiac arrest on the beach in front of the Surf and Racket Club. The woman survived and Stephanie said, “I’ll never forget it.” The general public is unaware that, depending on staffing, the lifeguards will respond to any emergency along the entire three-mile stretch of Siesta beach. Another incident involved a woman with two children who passed out near the water’s edge on Siesta beach. Stephanie was on break at the time, but was called to assist. She and another lifeguard transported her to the first aid room where they were met by fire department EMTs. The family has returned to the beach a number of times to personally thank each of the lifeguards, and their handwritten notes are proudly displayed in the lifeguard office. If Stephanie could spend the day with any person, living or deceased, she said it would be her dad’s father, Leland Charles Ganey. She never got to meet either of her grandfathers, but would really like to know more about her family history on her dad’s side. Among Stephanie’s favorites are, Owens Fish Camp and although she listens to a wide variety of music, Lana Del Rey is one of her top picks. An avid reader, Stephanie’s suggestion as a must read for all high schooler’s, “To Kill a Mockingbird”.